I had a professor who used to say there was an exact moment when modernism arrived in English poetry, and it was the third line of T.S. Eliot’s “The Love Song of J. Alfred Prufrock.” This is when Eliot, in a sudden and disturbing image, describes the evening sky as “Like a patient etherised upon a table.” The simile still carries a punch today, but this is just an echo of what it signified on publication in 1915. Drawing heavily on the jaundiced outlook of French symbolism, Eliot was making poetry confront the emotional register of modern life, with its lurking anxieties and peculiar sense of estrangement. But the awkward young émigré from St Louis, Missouri, did not end his contribution to modernist poetry there. Seven years later, in 1922, he published what is widely seen as its landmark work. The Waste Land, written while Eliot was recuperating from a nervous breakdown, is a five-poem sequence which considers from a mythological perspective the febrile and traumatised civilisation that had barely emerged from the First World War. Using an innovative collage technique, it splices together desolate scenes of ordinary life with references to cultures distant in time and space. It thus portrays a world haunted by the wellsprings of meaning from which it has experienced a terminal rupture. Around this void-like centre are layered a multitude of different voices or perspectives, all expressing the same anxieties, but isolated from one another by the poem’s abrupt, fragmented structure. Hence the “waste land” is echoed not just in the mundane suffering of individuals (“He’ll want to know what you done with that money he gave you / To get yourself some teeth”) and at the level of civilisational uncertainty (“Falling towers / Jerusalem Athens Alexandria / Vienna London / Unreal”), but also in the impossibility of piecing it all together. And strewn throughout, we find an eclectic array of characters and quotations from world literature, including Plutarch, Ovid, St Augustine, Dante, Spencer, and the Buddha. Of course neither abstruse experimentation nor pessimism were unusual in interwar literature. But even so, The Waste Land is remarkable for its over-wrought intensity. Eliot himself made light of this when asked for some explanatory notes to help baffled readers, producing an index of intellectual arcana that discusses everything from ancient vegetation ceremonies to the price of raisins. Indeed, it’s difficult to pin down exactly how much conviction Eliot had in his more apocalyptic pronouncements, and ultimately, whether you find the poem a compelling diagnosis of the modern condition or something akin to intellectual masturbation will probably depend on your own demeanour. However there is one area where The Waste Land has undoubtedly proved prophetic, and that is in the arts themselves. I was reminded of this recently by an exhibition at the Turner Contemporary gallery in Margate, called “Journeys with The Waste Land,” which explores how Eliot’s poem has resonated with visual art across the last century. The show is worth discussing, because it does indeed manage to illustrate some of The Waste Land’s most prescient insights – only, not in the way it actually intends to. The exhibition is enormous. With almost a hundred artworks, and too many big names to list here, there is bound to be something you will enjoy (for me this was Kathe Kollwitz, Paula Rego, Tacita Dean, and four huge paintings by the Eliot-inspired abstract expressionist Cy Twombly). It is also stimulating to see how non-Western artists, despite very different contexts, have echoed The Waste Land’s vision of modernity. But ultimately, these brief insights are diminished by the exhibition’s sprawling incoherence. Besides being curated around big baggy topics like identity, myth, and technology, it presents such a smorgasbord of concepts and of media – from painting, photography and textiles to installation, printmaking and video – you eventually feel like you’re winding through an enormous out-of-town supermarket. There are also unconvincing attempts to assign to The Waste Land the preoccupations of the 21st-century art world. In the first room, we read that the “key themes of the poem” are “gender, myth and journeying” – I must have read it fifty times and never has its concern for gender struck me as anything but incidental. Later, The Waste Land is portrayed as an eco-poem, “reminding us of our interference with and damage to cycles of nature.” It’s fitting, then, that the show occupies the same beach where Eliot wrote the lines “On Margate Sands. / I can connect / Nothing with nothing.” With its aimless approach, connecting nothing with nothing is exactly what this show has done. But inadvertently, “Journeys with The Waste Land” does illustrate something important about art over the last century, and to greater and lesser degrees, about many areas of contemporary culture. For what we see reflected in the exhibition’s radical diversity of expression, and in the tenuous attempts to glue it all together, is the absence of any stable or enduring framework for artistic value. It is a labyrinth of niches and paradigms which, though perfectly capable of aspiring to value on their own terms, can only be appreciated together if one adopts a detached, scholarly relativism. By failing to make this explicit, the curators have missed a trick; for here is a situation to which The Waste Land really is pertinent. As we have seen, Eliot’s “waste land” is an allegorical landscape, a disorientation at once cultural, spiritual, and psychological. Yet underpinning this, and in a sense embodied by the poem itself, is also a treatment of the uncertain purpose and meaning of art in modern society. When Eliot asks, in a crucial passage, “What are the roots that clutch, what branches grow / Out of this stony rubbish?” the question is partly self-referential. For as is suggested by the poem’s ephemeral, obscure and disjointed allusions to lapsed literary traditions, art can no longer be part of some holistic cultural and religious whole. This must be true because culture itself has become a shattered prism without any central axis. This realisation, in turn, casts a revealing light on the poem’s own experiments in form, structure, and idiom. Such innovations, however dazzling, are of only conditional value insofar as they do not issue from the roots and branches of a coherent metaphysical structure, but from its breakdown. Indeed, if The Waste Land is anything to go by, all that remains for the artist at this point is sifting through “a heap of broken images,” and seeking a new way of establishing continuity between them. Presumably, any attempt to invent new purpose will end up in the same position as the poem’s various characters: isolated and plagued by anxieties over their impermanence. Eliot’s contemporaries could not miss this message, for in the first two decades of the 20th century, the same atmosphere of social and cultural unraveling which inspired The Waste Land had caused something to snap in the realm of artistic production. This was the heyday of movement-based art, with its multitude of “isms:” Cubism, Futurism, Surrealism, Expressionism, Dadaism, Constructivism, Suprematism, and so on. These inter-disciplinary, avant-garde networks advanced not just new formal approaches but, more fundamentally, new and conflicting ideas about art’s purpose and value. Gone was the rigid art world of the late 19th century, in which a single curmudgeonly critic (John Ruskin) attacking a single painter (James Whistler) could produce a scandalous libel case. Within these new milieus, art was being variously imagined as a vehicle for revolutionary politics, as a specialist branch of aesthetic experimentation and contemplation, as a celebration of technology, and as a channel for the unhindered (and often unhinged) expression of the individual psyche. Such divergence, moreover, was self-perpetuating, since it dramatically accelerated the withdrawal of the arts into a separate sphere of discourse, detached from culture at large. This only heightened the nagging uncertainty about what artistic products are actually for, and whether they had anything of real use or relevance to offer society – questions which in turn guaranteed a further profusion of answers. But it is precisely The Waste Land’s unflinchingly avant-garde posture that makes its recognition of the crisis of artistic value so compelling. 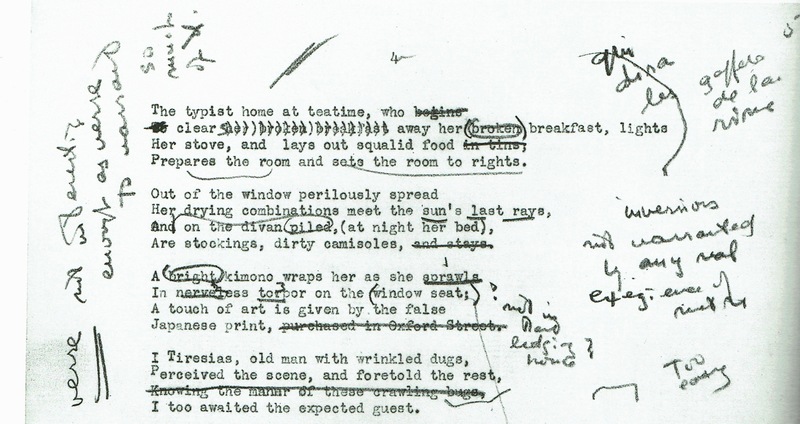 Eliot was disdainful of nostalgia; remember his earlier “Prufrock” was partly responsible for dragging poetry out of the corpse of Victorian romanticism. Moreover, as he pointed out in his 1919 essay “Tradition and the Individual Talent,” artistic genealogies are always in a kind of flux, as each new addition forces a fresh perspective on what has gone before. Eliot simply acknowledged that the modern perspective was defined by a kind of radical disjuncture, and wanted to explore the implications of that. This meant confronting the insecurity inherent to the modern artist’s task of, as it were, inventing his own values. Most forms of artistic production have been insulated from the full force of this dilemma by simple practicalities: novels, plays, music, film and architecture have limited materials to make use of and specific markets to target. I would argue these natural boundaries allow us to appreciate the creative freedom that modern culture has brought, without being too concerned that as a consequence, there is something arbitrary about the goals instantiated in any particular work. This is why the best illustration of The Waste Land’s insights can today be found in art galleries and magazines. Having been subject to ever-fewer conventional constraints and popular expectations, this expanding ragbag of purposes and practices has come to embody the profound uncertainties that entered culture a century ago.